I’m not vegan – I’m a carnivore. But there are lots of reasons not to eat meat: many different schools of dietary science recommend restricting your meat intake, meat preparation often involves unnecessary cruelty to animals, raising animals for meat causes more environmental damage than plant harvesting, and it’s more expensive. Plus, my wife is almost vegetarian, so avoiding meat when we are together makes it easier for us to share. But one of the Southern foods I love, shrimp and grits, is not vegetarian. I love it for the flavor, and for the science: shrimp and scallops are both small food items, so they cool rapidly; embedding them in a bowl of hot grits both keeps them warm and imparts flavor to the grits. And besides, man, come on: cheesy grits and hot sautéed shrimp or scallops. How can you go wrong? 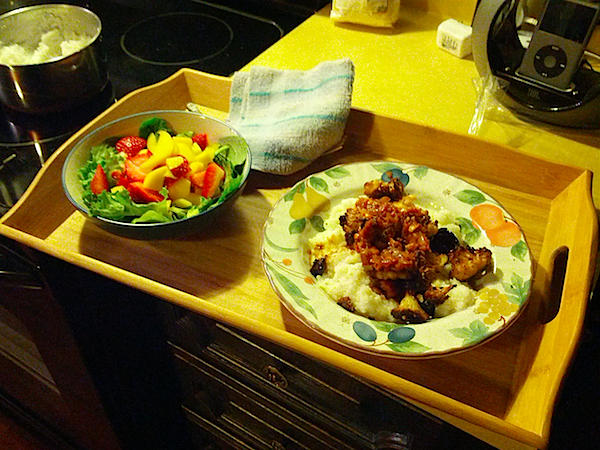 But I’m always thinking of how to adapt dishes so my wife and I can eat together. And it struck me: one of the things we love to eat is baked cauliflower. My wife chops cauliflower up into small florets, brushes them with a little olive oil and a little seasoning to taste (paprika, seafood seasoning, even wild and crazy things like allspice or nutmeg might work) and cooks them until they’re turning crispy. So why can’t that be put on grits in place of shrimp? We talked about it and agreed to the idea. A simple salad – organic greens, mango, walnuts, inspired by a salad from Aqui – grits, and vegan attempts at scallops and shrimp. After we agreed to the menu, I researched recipes online, found a mushroom based scallop recipe, and called back to confirm with her what she wanted. We cut out a few things from the recipes she didn’t want (the cheese, etc) and I picked it all up. What can I say? It turned out awesome. We both went back for seconds, and were so taken by the shrimp and grits we forgot to eat the bread we’d prepared and she actually never got to her salad before she was full. (I ate mine, though. 🙂 Here are the pieces of what we did, and then I’ll tell you how we put them together into a meal. All of the below served two people, and we were overly full. Wash or otherwise prepare the organic greens. Dice the mango. Wash and slice the strawberries. Assemble the salad by adding greens, walnuts, cranberries, mango and strawberries to taste (Obviously, we did not use all the ingredients; my wife will be eating from the above for several days, as is her habit). Add dressing to taste or make the dressing available on the table (axually, me and my wife often eat the salad dry, but that’s an idiosyncrasy from training ourselves to use very little dressing). 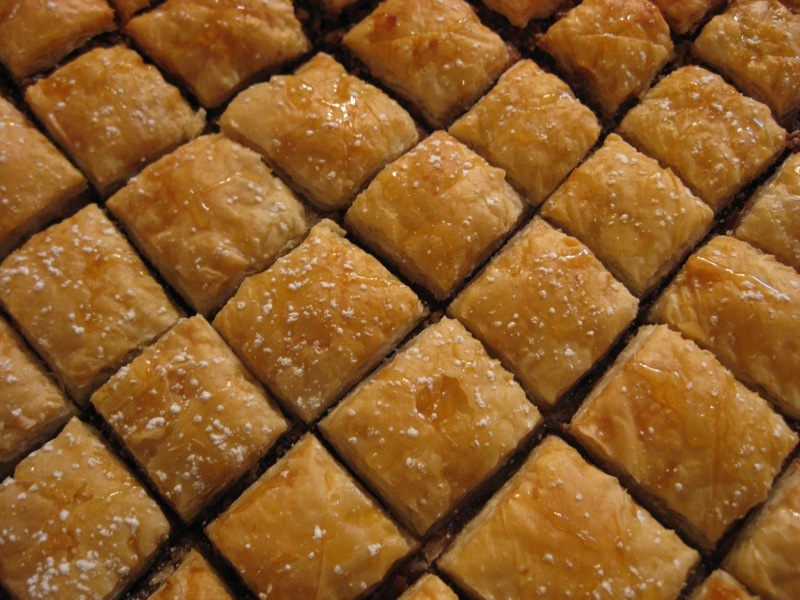 Slice off several pieces; do so diagonally if you want more surface area. Toast until your favorite degree of brown. Not hard. Don’t forget to eat this as you are scarfing down grits later, or you will be sad that you have missed part of the experience. Preheat an oven to … uh, I dunno, my wife cooked this. Preheat it to something or other that’s really hot. (UPDATE: my wife says to heat it to 450 to 430). Chop up or break up the cauliflower into small florets, a bit larger than a shrimp. 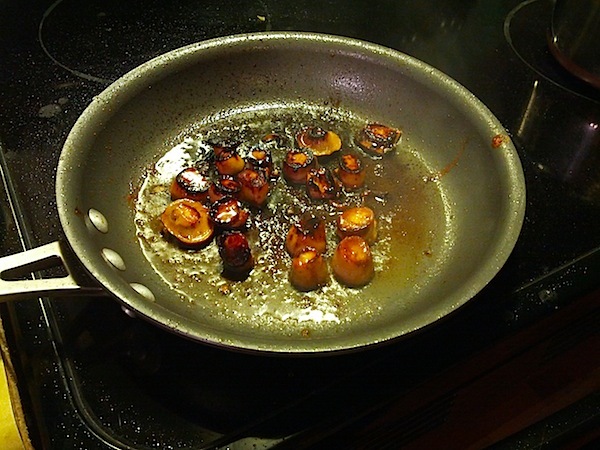 Let it dry before you put the oil on or it is soggy (but that doesn’t taste bad either). Put the cauliflower in a bowl and add enough olive oil to coat them without making them soggy – just kind of drizzle it on and stir it around real good. Add spices – use seafood spices if you want a shrimpy taste. The great thing about cauliflower is you can use almost any seasoning you want. Paprika oddly doesn’t have much flavor, my wife claims; dill is better, but the ones listed above are her three favorite. Place tray in oven. Leave for ~1 hour-ish, removing when the cauliflower starts to crinkle up. You have a LOT of leeway on this, as roasted cauliflower is edible and delicious all the way from almost purely raw to shriveled and almost burnt. Lightly wash and pat dry the oyster mushrooms; they need to be very dry to absorb the marinade. Shallots as we used them are orangey garlicky looking things; chop up one or one half shallot clove into very tiny bits. Add the mushroom pieces and shallots to a bowl and drench with enough soy sauce to either cover them or mostly cover them so you can repeatedly drizzle the sauce over with them with a spoon (we did the latter). Add a small amount of honey, or more if you want a sweeter taste. (The original poster recommended other optional things like liquid smoke, which are out of my cooking league at this time). Add ground pepper. 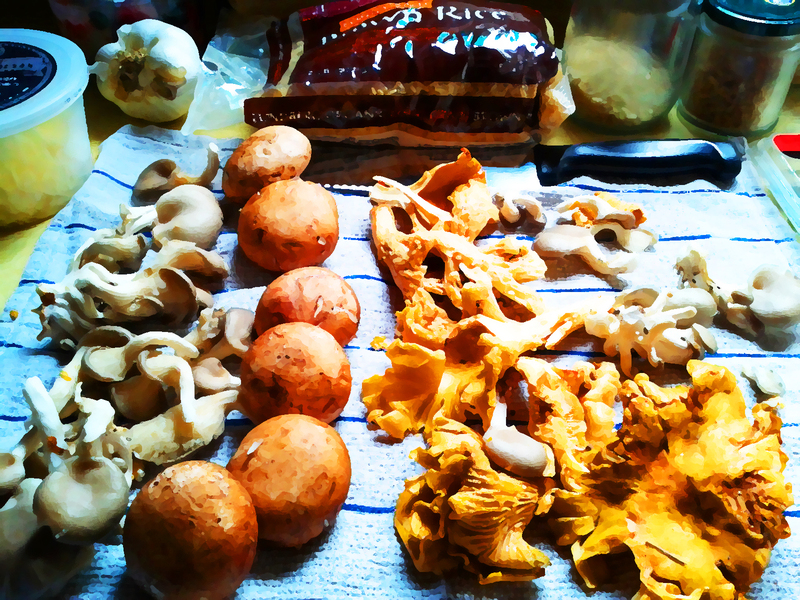 Let marinade for 15-30 minutes or so, until the oyster mushrooms are picking up the color of the marinade. Then we’re ready to cook, though we want to time it to finish up with the grits and other stuff. Take a pan and heat it to high heat with a dollop of high heat safflower oil. Add the mushroom discs, flat side down; don’t stir around too much or you will “disturb the sear”. After a minute, flip the mushrooms and let them sear again. Then add the rest of the sauce. This is the point where big boys and girls who read Cook’s Illustrated can add a splash of white wine or liquid smoke to get a more complex flavor. “Next is the most important part to good scallop mushrooms” says Kathy of the King Oyster Mushroom Vegan Scallops recipe, and she ain’t lying. Turn the heat down to medium high and tilt the pan so the juices and ‘shrooms pool together and use a spoon to lift and pour the juices over the mushrooms. The heat will continue to evaporate the sauce; I guess this is what big boys and girls who read Cook’s Illustrated call a reduction, but I just call it thirty one flavors of delicious. Keep doing this until the sauce is almost gone and the “scallops” are nice and dark and cooked. Oh, on timing, you want to do this whole step almost last. I’ll get to that in the next sections. We did old fashion grits rather than instant grits, probably because I was at Whole Foods but it turned out to work out really well for us. Follow directions, but basically, it’s boil the water, add the grits, turn the heat down. It depends on the grits you get. Chop up the shallot really fine. Do the same thing to the garlic. Dice the onion. In a saucepan, add olive oil at medium high heat, then add your onion mixture. Cook until the onions are golden brown or at least translucent. Then add the soy sauce and flinch back from the spray of oil. The boiling liquid will cook the onions the rest of the way (seriously, I’m not joking around about the soy and the flinching; I do this for other dishes too and it’s a perfectly legitimate if messy cooking technique). Add the salsa once the mixture has started to reduce. We went heavy on the salsa and reduced it until it was thick, but in hindsight when I eat this the sauce is often runny enough to pour out over the grits and give them a good flavor. You might achieve this with more soy or Worcestershire sauce. On timing, I actually did the king oyster marinade first, then used the shallot while making this, then came back to finish off the sautéing of the “scallops.” So now’s a good time to talk about how to put this all together. Prepare your salad first and set it aside. Cut your bread and set it aside, preparing to toast it at the last minute. If you’re making vodka mango smoothies to go along with your meal (recipe not shown), do that in advance too. Start the cauliflower. Chop and prepare the marinade. Start the grits. Chop and prepare the topping. Around this time(ish) take the grits off. Pour the finished topping off. Sauté your mushrooms. When they’re almost done, start toasting your bread. Take the mushrooms off. Scoop grits into your bowl. Scoop scallops on top of the grits. Scoop cauliflower on top of the grits. Add your topping to taste. Add your toast pieces. Make sure you have forks, knives, salt, pepper, and optionally Tabasco. Bring out your salad bowls along with your bowls of vegan grits, serve, eat, and bliss out. The yums. Definitely doing this again. Well, my wife feels like she’s about done with animal products, except for eggs that she can verify the source of from local farms, or the occasional cheese or daily product as part of a vegetarian meal at our favorite local restaurant, but I’m not vegan, and I didn’t take any special steps to make sure the ingredients for these recipes were vegan. So the practical upshot is, I can’t guarantee these recipes are vegan. The source recipes are vegan and we’re pretty sure all the ingredients were plant products, but I am not a vegan, and I can’t guarantee that some non-vegan items didn’t slip their way in there. After-afterword: What’s up with this blogpost? If you read it earlier, and it was weirdly truncated, it was because of some weird interaction between WordPress, Ecto, and me slamming my laptop lid when I thought Ecto had finished uploading my blog entry. The downside is I had to rewrite half of it and it’s much less funny when I’m not typing at 500 words a minute trying to finish before Coupa Cafe closes. The upside is my wife was behind me while I typed, cooking another iteration of this meal for her late-night dinner, and she filled in a lot of the things that I missed and corrected some things I got wrong. Pound cake is practically my favorite food. It’s right up there with Lebanese favorites like tabbouleh and kibbey nayye and right up there with my favorite dessert, the Panera Bread cinnamon roll. But not all pound cakes qualify: I like slices of large ring pound cake in the style carried by Ingles grocery store in Greenville, South Carolina. 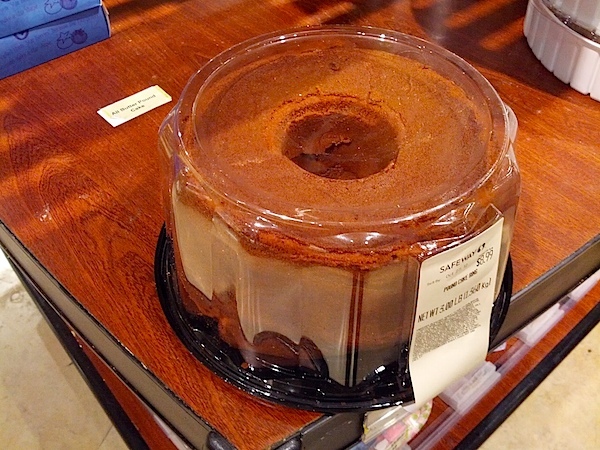 As I’ve moved from city to city, I found substitutes – the Kroger ring pound cake in Atlanta and the Safeway ring pound cake in the Bay Area. For a while, however, Safeway stopped carrying this item, so I started baking my own pound cakes for my evening ritual: two slices of pound cake, one glass of milk, and a book, just before bed. 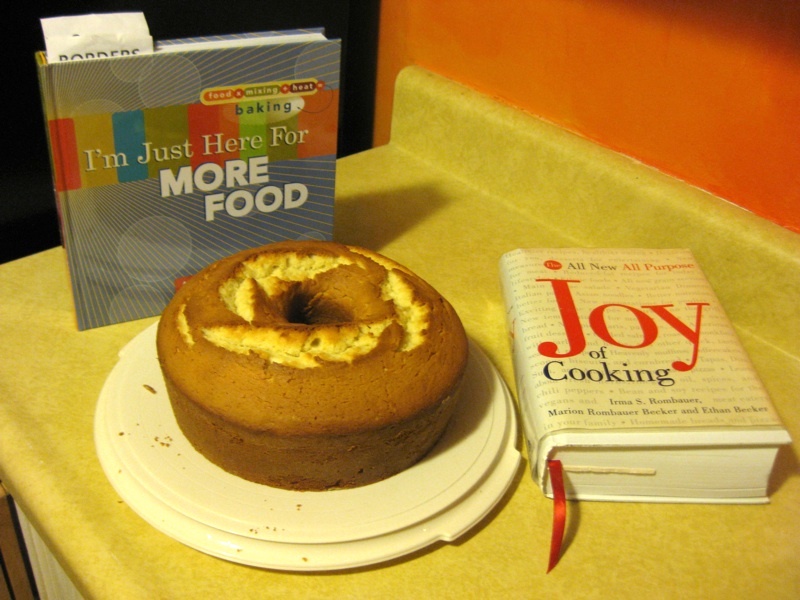 Someone asked me about a good pound cake recipe, but as it turns out I haven’t made pound cake in a while as (a) my oven failed just before (b) Safeway began selling ring pound cakes again right around the time (c) my first novel got published, at which point writing sucked up the time I spent on other hobbies. Wow. That last bit is really true: I just don’t have as much time for karate or cooking or anything else because I gotta write, not just for enjoyment but because people want to read my stuff. But (b) is the controlling factor, because I gotta have pound cake, and I could make time if I had to since I have a doorway to extra time. New recipe, not as sweet as last time but structurally better. Used a deep bowl big enough to handle all batter, which speed up mixing and made things cleaner. Let butter sit as long as it takes to soften on its own, or you won’t be able to make it fluff. Beat egg yolks, egg whites and vanilla together for mixing into creamed butter. Sift non-sugar dry goods (salt, baking powder, flour) together 3 times. Alternate adding dry goods and buttermilk to the batter. Let cool in the pan for at least 15 minutes. Rack cool for at least 15 minutes. Comments: People preferred the flavor last time, the structure this time. Carefully flour the pan to prevent sticking. 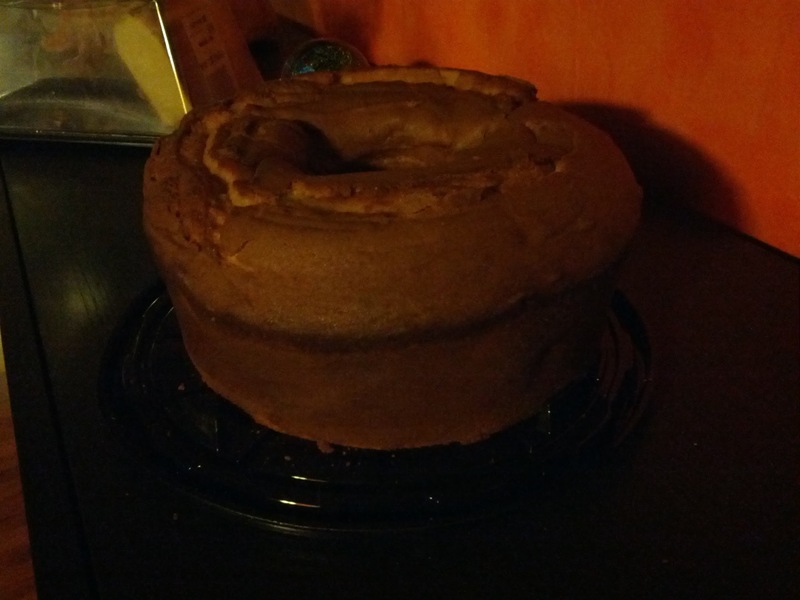 The oven was preheated to 325, baking was 1 hour, and the cake was allowed to sit a bit before being taken out of the pan. Results: Yum. The texture was light and flaky, on the edge of being too flaky. The flavor was good, though slightly bland – it could have used more vanilla. The crust had a good texture, but it could have been a bit darker. See my blogpost for more details. These are the last things I have records of trying. 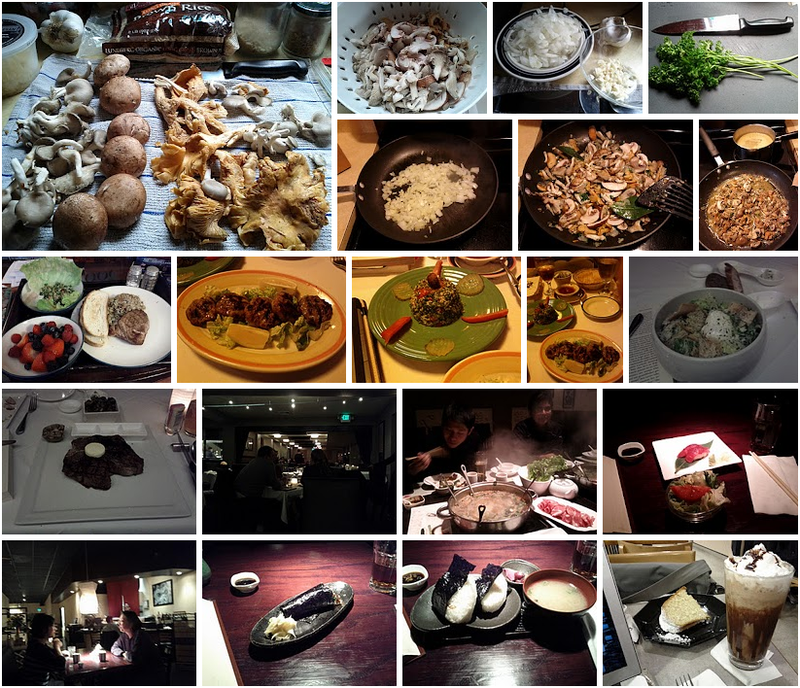 Those familiar with my Google+ stream will have noticed I take a lot of pictures of food, generally posted in my album Cuisininart (pictures of food – cuisine in art – cuisin-in-art – a riff on cuisinart – get it? No? Oh, you don’t WANT to get it. Oh well.). This got started because I wanted to do restaurant reviews on this site. I love eating out; I’m a definite foodie, and I think a lot about what makes a good restaurant, from a dive bar to a five star. I’ve evendone a few reviews but I noticed I wasn’t writing reviews because I wasn’t taking pictures. I prefer using pictures in blog posts based on the ideas of my good friend Jim Davies (and seconded by my wife Sandi Billingsley) who both think pictures make blog posts stronger. This is basic comics theory: words and pictures are stronger together. So I started taking pictures. As usual, I found I was really good at collecting input, not so much at producing output. I was taking pictures all the time and not doing things with them because most of my free time is spent writing. 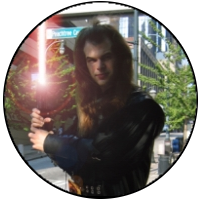 Around the time Google+ came out, I had a brainflash: why don’t I just post the pictures I’ve taken as a way of using them up. So I created the Cusininart album … which prompted me to take more and more pictures, even without reviews in mind. I got so good at taking pictures of what I was eating it became a joke. My wife once explained it to a friend joining us for dinner: “He likes to take pictures of his food.” Which in turn prompted this post of me explaining this to you. But I’m trying to turn this into more than just random photographs. Following the example of people like Jim Davies, Andy Fossett and Waldemar Horwat, I’m trying to make this a learning experience, to discover how to take good pictures of food. What I’ve found so far isn’t scientific by any stretch of the imagination; consider this lessons learned from a few case studies. Don’t use your camera’s flash. As many of you probably already know, camera flashes wash out the pictures. Don’t use it unless you absolutely have to; try increasing the exposure of your camera to instead. Take lots of pictures. Take pictures of each dish, of the whole spread, from more than one angle. It’s not just that two or three shots of each one helps you avoid loss to a blurry jiggle; it gives you more choices for the article. Take pictures from different angles and distances. Thirty to forty-five degrees seems to be a good angle, but you should experiment with closeups, overhead shots, distance shots. You’ll be surprised what looks best once you review the pictures later. Most of the shots should be of food. For what I want to achieve in my albums, having most shots be of food works best. 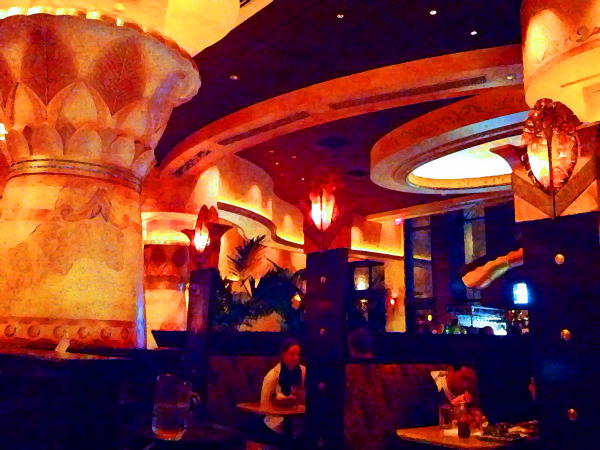 Restaurants are less interesting than their dishes, unless it’s a special restaurant. One out of five is OK.
Keep it candid. It actually helps to take pictures before you’ve eaten, and even to spend a moment posing some of the food. But don’t waste a lot of time on it: the immediacy of the dishes in their natural arrangement is often enough. I’m sure I could refine that list more. Perhaps I will after I spend more time experimenting more systematically, maybe even throwing in findings from food I have cooked. 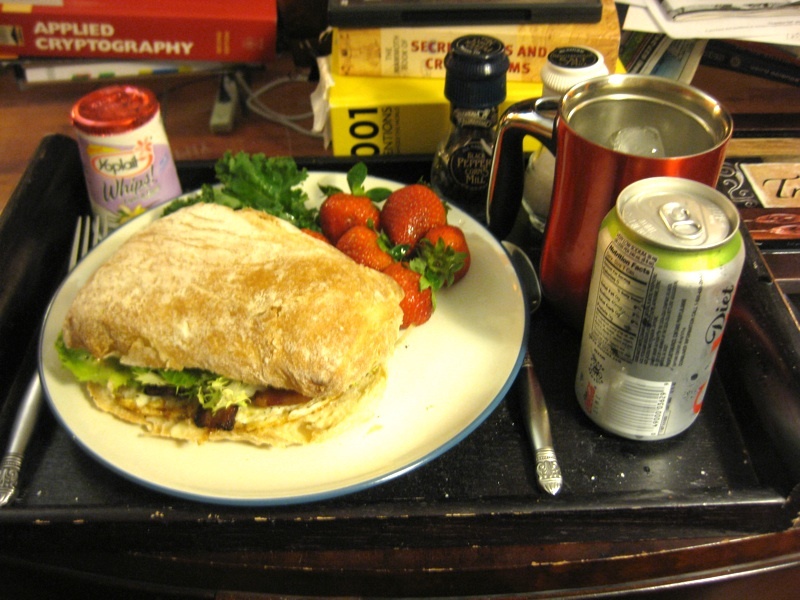 But until then … that’s what I’ve learned from taking pictures of my food. There are disputes about those figures, of course, but at ~105 calories a banana, you’re getting roughly 143 times your daily allotment of 2000 calories, so probably you should cut back anyway. P.S. One BED (Banana Equivalent Dose) is 0.1 microsieverts of radiation. 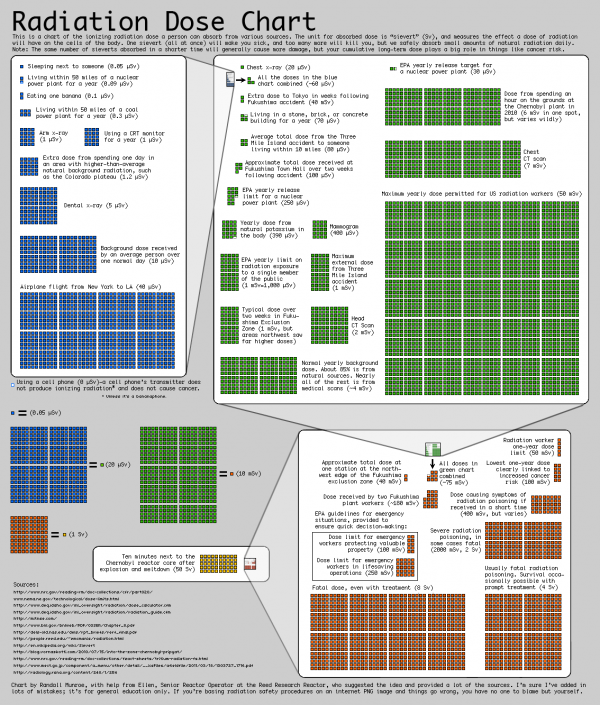 XKCD claims that 100 millisieverts of radiation is the lowest dose linked to increased cancer risk. Take that with a grain of salt … but do the math. Tabbouleh and butter lettuce, veggie burgers in wraps with smoked Tabasco and coleslaw, sweet potatoes with honey, my loving spouse, and a couple of episodes of Black Lagoon: the Second Barrage. Rinse the bulgur in water and leave soaking in 1.5x cups of water for 30 or so minutes in the fridge; optionally add the juice of a lemon to the water. Wash the parsley and chop as fine as possible (tip: separate into small, manageable bunches, roll the bunch tightly and hold it, cut with a knife to discard the stems, turn the bunch a quarter turn, and cut again as finely as possible; continue turning and cutting until the bunch is consumed and then chop any stragglers). Wash the green onions, cut off the roots and the frayed ends of the greens, and chop as fine as possible. Wash the tomatoes and dice them as fine as possible. Remove the bulgur and drain in a fine collander. Combine the parsley and green onions in a large mixing bowl. Add the bulgur to the mixing bowl by taking a handful at a time, squeezing out any remaining moisture before tossing in; you may add more or less bulgur at this stage to your preferred texture. Stir until thoroughly mixed. Add the spices to taste. Add the tomatoes and stir until thoroughly mixed; you may add more or less tomatoes at this stage to your preferred texture. There should be a reasonable amount of juice at the bottom of the mix at this stage. Add lemon juice and olive oil to taste, alternating one to two large tablespoons of juice with oil so the mix never gets overwhelmed. Add any remaining spices to taste. Serve in a bowl on top of leaves of lettuce, or however you want. 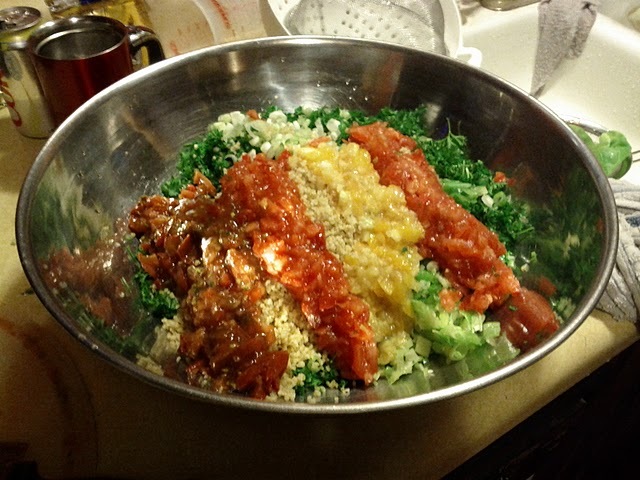 Pictured: the tabbouleh, just after tomatoes are added but before mixing. Sometimes it’s hard to do the right thing. For example, I enjoy eating dinner out. There’s nothing wrong with that; but it’s always easier to eat out than it is to fix dinner, as I can have high-quality healthy food made for me while I read or write or draw, whereas cooking at home involves shopping, cooking, and cleaning that I’m fortunate enough to be able to pay other people to do (and that through the absurd good luck that the rather esoteric work I was most interested in doing in grad school turned out to be relatively lucrative in real life). But that’s not fair to my wife, or cats, nor does it help me catch up on my pile of DVDs or my library cleaning or any of a thousand other projects that can’t be done out at dinner. Sometimes I deliberately go out to dinner because I need to read or write or draw rather than do laundry, but I shouldn’t do that all the time – even though I can. 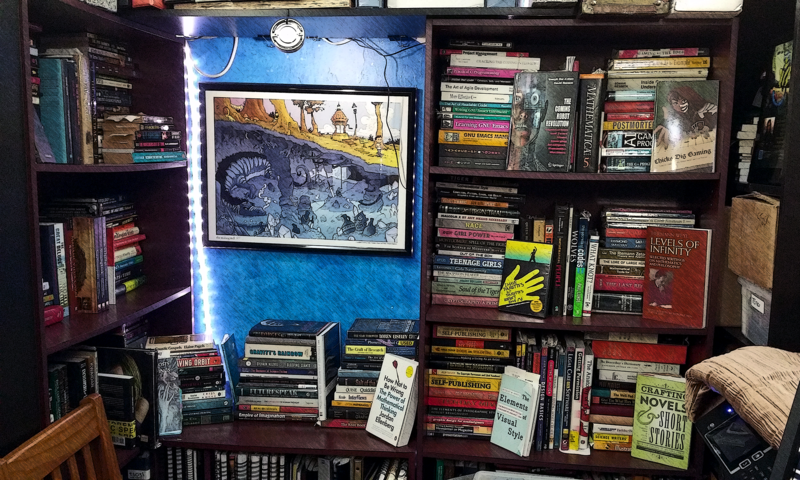 But, if I keep making local decisions each time I go out to eat, I’ll keep doing the same thing – going out to eat – until the laundry or bills or book piles reach epic proportions. This may not be a problem for people who are “deciders”, but I’m definitely a “get-stuck-in-a-rutter”. So how can I overcome this, if I’m living with the inertia of my own decision making system? One way is to find some other reason to come home – for example, cooking dinner with my wife (normally not convenient as she eats early, while I’d normally be at work, and even if I did try to get home her dinner time traffic puts me an hour and a half from home; but we’ve set a time to do that from time to time) but she’s out of town for business in New York, so I don’t have her to help me. So the way I’ve been experimenting with recently is treating myself. Over the weekend I made a large bowl of tabbouleh, one of my favorite foods, and pound cake, one of my favorite desserts. The next evening I grabbed a small plate of sushi from Whole Foods and made another dent into the tabbouleh. I had a commitment the next night, but the following night I stopped to get gas and found that a Whole Foods had opened near my house, and on the spur of the moment I decided to go in, get a ribeye steak, and cook myself another dinner, eating even more of the tabbouleh. The tabbouleh itself is healthy, and maybe the sushi is too; the steak, not so much. Normally I wouldn’t get another steak as I’d had a few recently, both homecooked and out at restaurants; but I wanted to overcome my decision making inertia. It would have been so easy to note the presence of the Whole Foods for later and go eat out; instead, I said explicitly to myself: you can have a steak if you eat in. And so I walked in to Whole Foods, walked out a couple minutes later with a very nice steak, and went home, quickly cooked a very nice dinner, and got some work done. Normally I prefer to eat about one steak a month (or less), sticking to mostly fish as my protein source, but I’ll let my red meat quota creep up a bit if it helps me establish the habit of cooking more meals at home. Once that habit’s more established, I can work on making it healthier again. Already I know ways to do it: switch to buffalo, for example, which I prefer over beef steak anyway (and I’m not just saying that as a health food nut; after you’ve eaten buffalo long enough to appreciate the flavor you don’t want to go back). So far, tricking myself into doing the right thing has been a success. Now let’s see if we can go a step further and just do the right thing on our own. 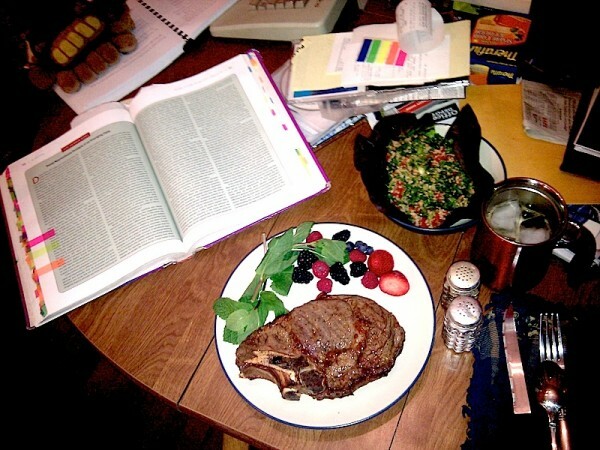 Pictured: a ribeye steak, fresh fruit and mint garnish, tabbouleh in a bed of red leaf lettuce, and Gazzaniga et al.’s textbook on Cognitive Neuroscience. 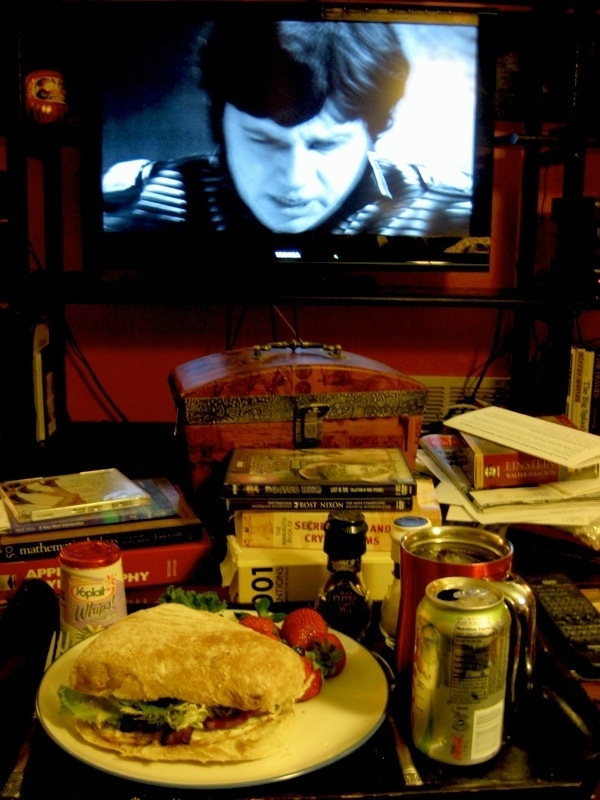 From the Doctor Who – Lost In Time DVD Set: Enemy of the World, a bit cheesy in parts but proving that Doctor Who can handle intrigue, Patrick Troughton can indeed act like two completely different persons, and Jaime McCrimmon (pictured) can be written as sharp and resourceful rather than a complete idiot. Overall, the Lost in Time collection both shows both the creaking corners of the old Doctor Whos as well as stunning moments when the show was just “on”, as sharp or sharper as anything on the air today. Hint: almost anything involving the Daleks usually has a nice, tangy metal edge. From wichcraft restaurant’s cookbook of the same name, a bacon and egg sandwich with olive oil / red wine vinegar tossed frisee on a split ciabatta roll toasted on the inside with a thin layer of gorgonzola cheese, proving that you can make a sandwich into a gourmet meal. And that I don’t particularly like gorgonzola, but that’s not the fault of the sandwich; it actually went quite well with the rest of it. What Do I Actually Know How To Cook? There’s a subtle theme there. There are a few other things that get made in our house that I make to other people’s recipes – Hummus, Cleveland Burgers, “California Dreaming Style” Grilled Chicken Salad – and a few other things that we eat that my wife or friends typically prepare. I’ll try to go through these recipes and post as many as I can. Due to their levels of radioactivity, her papers from the 1890s (and even her cookbook) are considered too dangerous to handle. They are kept in lead-lined boxes; those who wish to consult them must wear protective clothing.